It appears that our “New Economy” has made people take a good look at needs vs. wants. These days, more people (as much as 1/3) feel that a dryer is no longer a necessity, rather its a luxury and an expensive one at that! Line drying used to be the standard and we are trending toward that again (We’ve doubled the number of people who say the dryer is a luxury in the last three years). Here’s how to fire your dryer which will result in lower energy bills (good for you and the planet) and happy clothes (the dryer is hard on clothing). No matter the climate you live in, you can air dry clothing. Read on to learn how to fight restrictive CC&R’s for your right to dry and ways to circumvent such silly ordinances. Clothing can be placed on hangers and hung from shower stalls, towel bars, doors, etc… Folding drying racks can be set up quickly in front of the washer, in the bathtub, or in a bedroom. These options allow you to keep drying clothes out of the main living area. During warm weather, move the racks outside or set up drying lines. We string cord from the raised deck to the fence line. This keeps drying clothes out of eyesight of the neighbors and was an inexpensive option. If you live in an area where line drying is prohibited by CC&R’s, then set up the racks in a garage or under a covered patio area where they won’t be visible. If you run fans during the day (like we do instead of A/C), then set your racks up where the air will blow on them, this assists in faster drying and the motion helps to prevent too much crispness. Drying stained clothing outside can help remove stains (works especially well for cloth diaper stains). I’ve found that super sunny days tend to cause our towels to become a little too crisp, so I hang them out in the evening and allow to dry overnight. If needed, I toss them in the dryer with a Mrs. Meyer’s dryer sheet and a damp washcloth for a few minutes on no heat to soften prior to folding. Fight for your right to line dry. 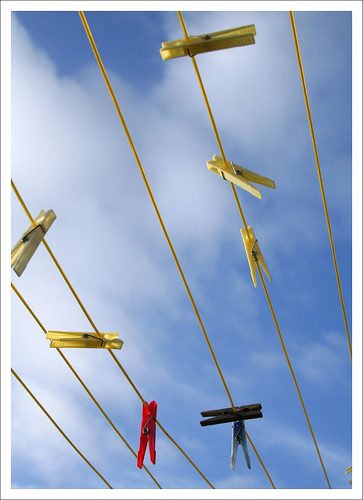 Project Laundry List helps fight anti-clothesline ordinances. Find out which cities have a “right to dry” and sign the national law petition and urge the First Family to hang clothes out on the White House lawn by visiting Right To Dry. Tip o’ the day- hang your lines low enough for the little ones to help hang out the wash. It’s a fun time to have a little chat with your critters and teach them a lesson they will (hopefully) carry into adulthood. Photo Credit: Line Dry by Placid Casual on Flickr under Creative Commons License. I’ve always line-dried about 50% of my stuff, but living in an apartment, I don’t have a line and only have room for one drying rack. For some of these items, I dry them in lingerie bags for 10-20 minutes to reduce crispiness and wrinkles and then hang them to dry (the bags protect them and make them easier to locate). I think my clothes last longer because of my line-drying efforts too! I’ve been using a drying rack for several years. It also keeps your clothes in better shape than using a tumble drier. I can’t use drier sheets or fabric softener due to skin allergies. If my clothes dry stiff on the rack. I pop them in the drier with a damp face cloth for 5 minutes. Shake out the clothes immediately they are soft and almost wrinkle free. It’s unfortunate that people got out of the habit of using clotheslines. They save so much energy, and it is kind of peaceful to hang the clothes. Rainy days and winter make outdoor drying difficult, but people can air dry their clothes by using a clothes drying rack like this one. Being round it works really nice under a ceiling fan!